Secretary of State Mike Pompeo arrived in Afghanistan on Monday, kicking off an unannounced visit to the country. Pompeo, who arrived in the capital city of Kabul, is expected to meet and hold a joint press conference with Afghan President Ashraf Ghani. An Afghan official told Radio Free Europe/Radio Liberty of the secretary's secretive trip; it is his first to Afghanistan as secretary of state. Such trips by senior American leaders are occasionally not announced publicly until the individual has already arrived due to security reasons, giving terrorists little time to plot an attack. Other times the visit is unannounced as a result of being planned last minute. The United States has approximately 14,000 troops in Afghanistan who continue to carry out counterterrorism operations against Islamic State and al-Qaeda militants. It's hoped that the latest operation in a remote district in eastern Nangarhar Province – an area around Deh Bala – will clear IS fighters and other insurgents in the region. The operation has been carried out by U.S.-backed Afghan special forces. Pompeo's stop in Afghanistan is part of a lengthy trip, which has included meetings with leaders in North Korea, Japan, South Korea and Vietnam. During his stop in Vietnam, the country handed over the remains of two American service personnel to American military members. Pompeo used the occasion of the transfer of remains to urge North Korea to do the same. 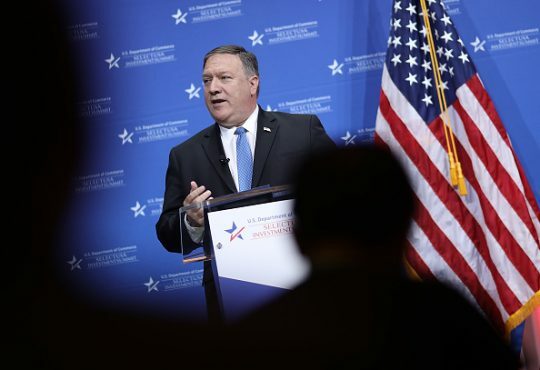 "Before I arrived in Hanoi, #Vietnam handed over the remains of 2 US servicemembers," Pompeo tweeted. "This same act 45 yrs ago built trust between our nations. Today we have a strong relationship. #DPRK committed to repatriate remains as well. This step will build trust & confidence btw US & DPRK." This entry was posted in National Security and tagged Afghanistan, Mike Pompeo, North Korea, Secretary of State. Bookmark the permalink.